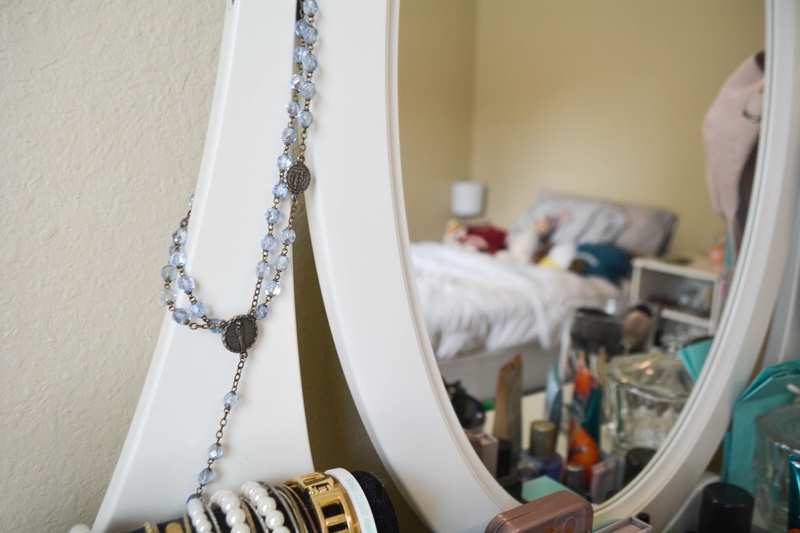 After I posted my bedroom tour I received a lot of questions about my vanity. 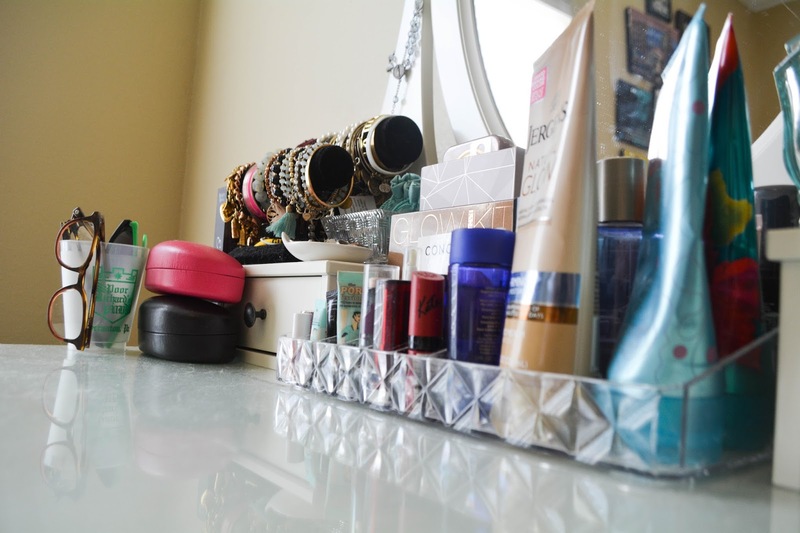 This gave me the idea to show you guys a little bit more of an in depth view of my vanity and how I organize my makeup. 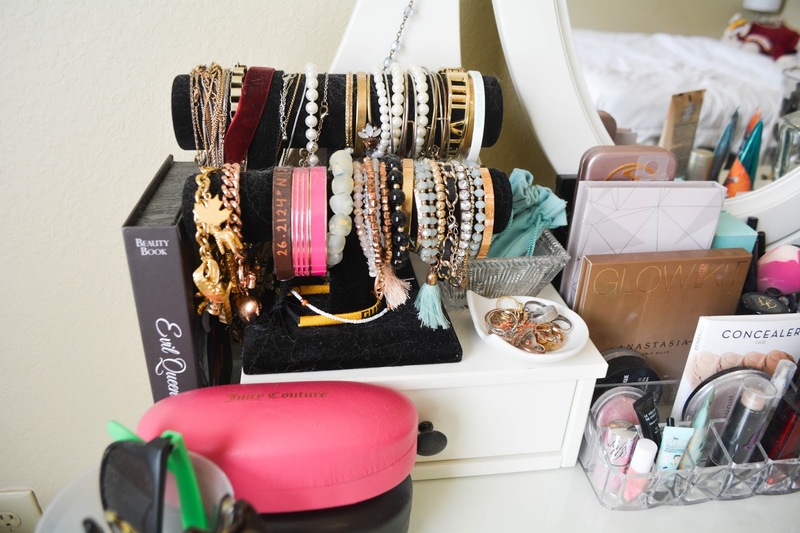 I also wanted to link everything that is on my vanity, but as I said in my bedroom tour post some of these items were given to me as gifts. 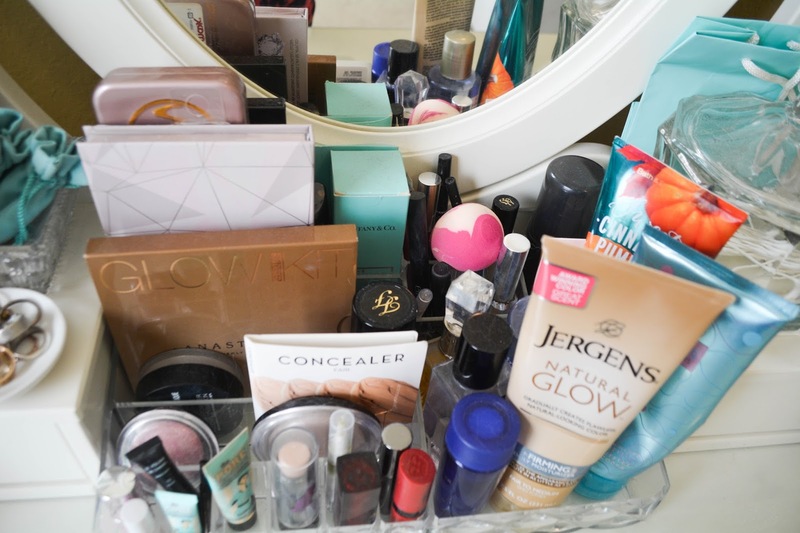 I've done a few post showing you all my newest and favorite makeup products, but I've never actually showed you how I organize it all. 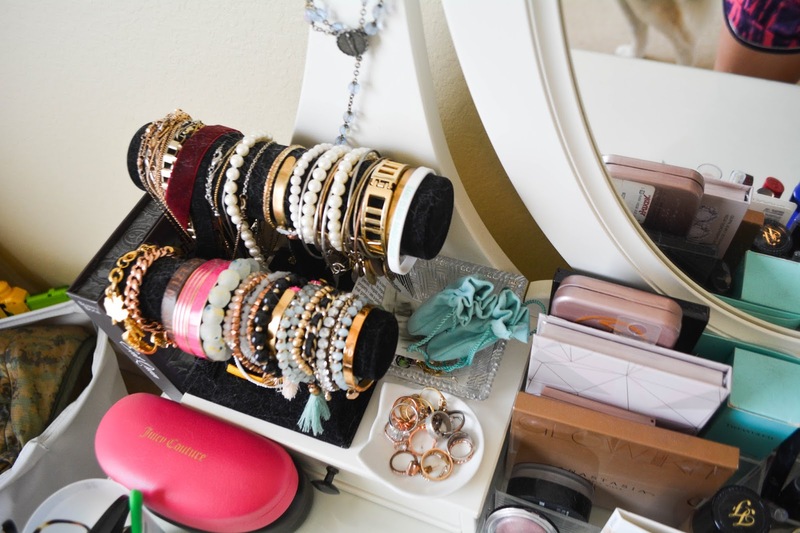 Let's start with the actual vanity itself. This vanity is from IKEA and it was a gift from my parents for my 20th birthday. 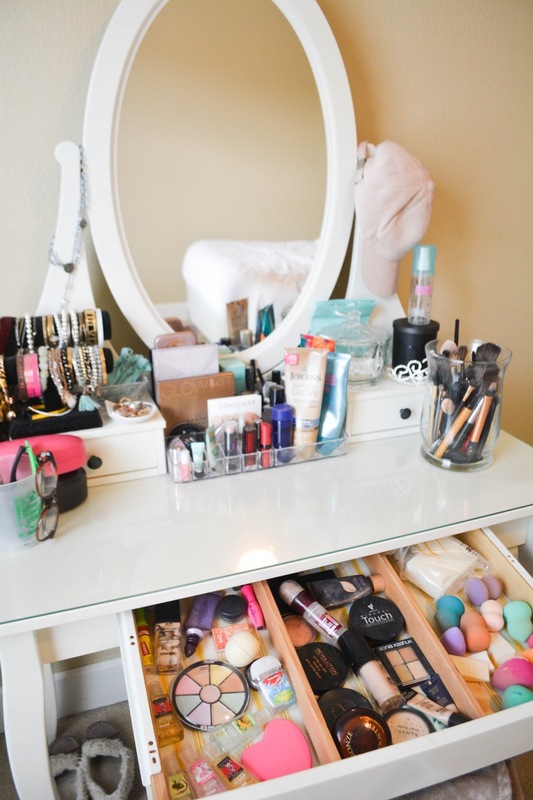 I have always wanted a vanity, but I could never find the right one to fit my style or fit in my room back home. I love the white with the glass top it just gives it a more chic look. On both sides of the mirror there are two little drawers and then I have a longer drawer underneath with three sections inside. 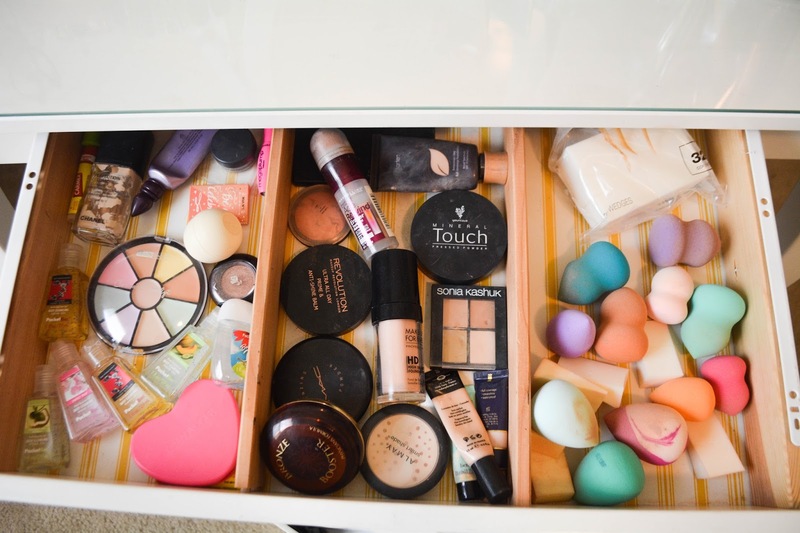 I love that the vanity comes with multiple drawers because it makes storing things a whole lot easier. 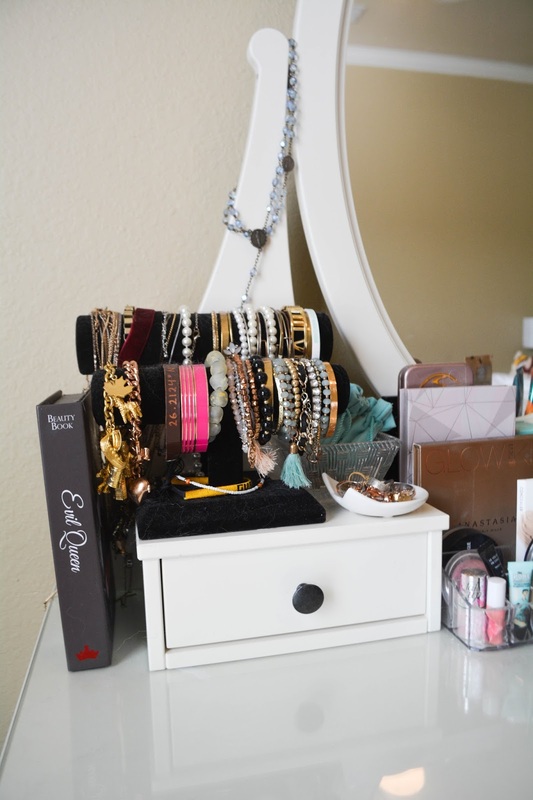 Starting from left to right I have my jewerly holders. 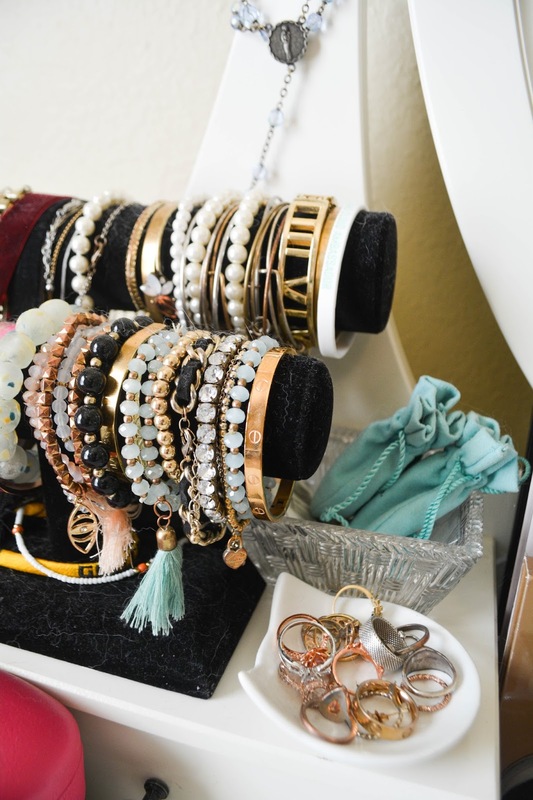 These black velvet holders are from Marshall's and it holds all of my necklaces and bracelets. 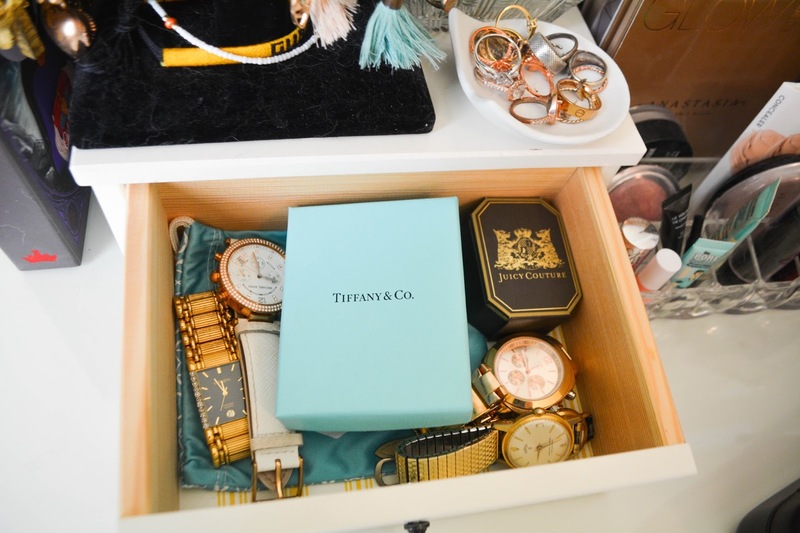 Inside the small drawer I keep my watches and spare holders and Tiffany & Co. bags. 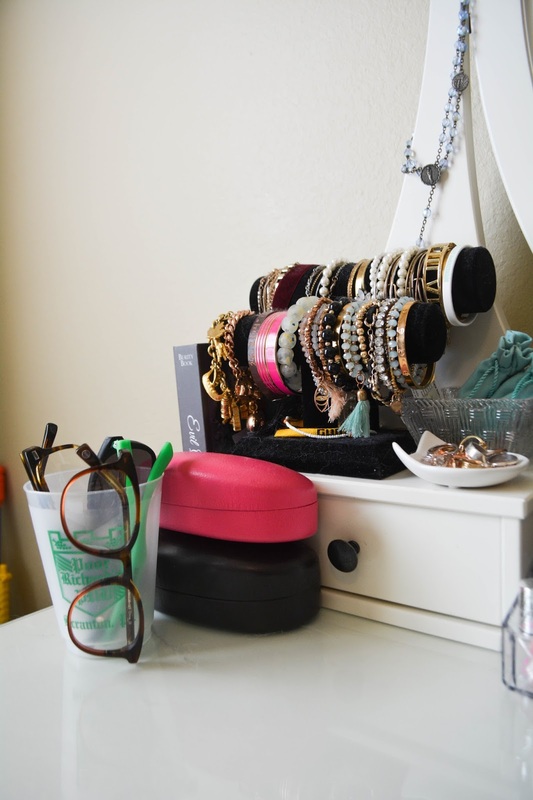 Next to that are two little trinket trays which hold my earrings and rings. The cat one that is holding my rings is a Christmas gift from Rocio and the crystal bowl that holds my earrings is a Christmas gift from my Aunt Maryland and it's a Tiffany & Co. crystal bowl. Behind the jewelry I have a rosary from my great grandmother. I also have a Disney eyeshadow pallete that I got for Christmas from my mom. 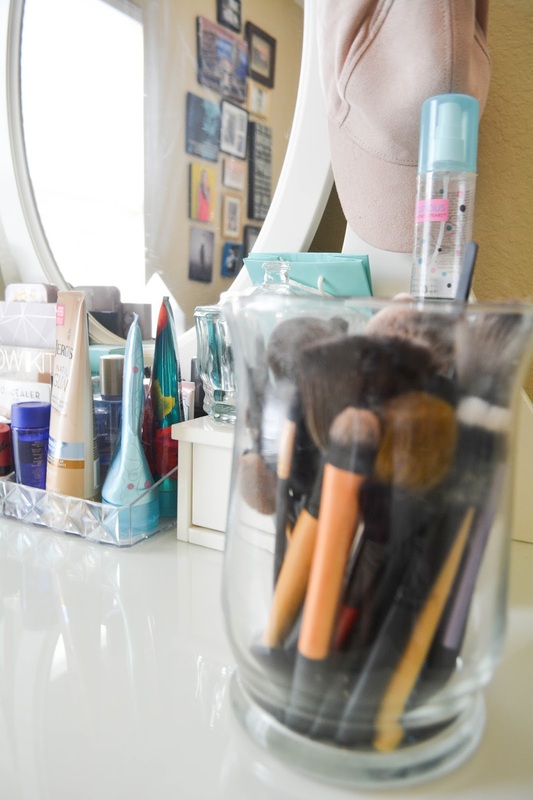 In the middle between the two drawers I have an acrylic makeup holder I got from Marshall's and it fit so perfectly on my vanity. 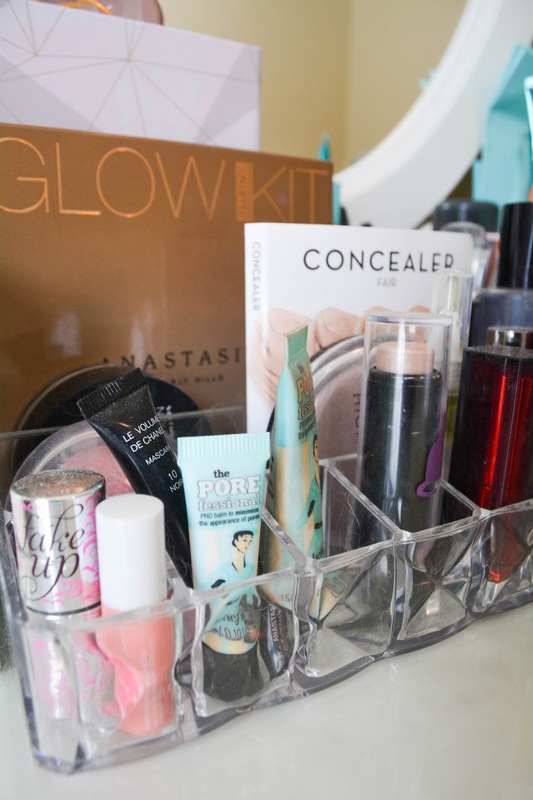 This holds my everyday or current favorite makeup products. It holds so much and it's easy for me to see all of my options between my eyeshadow and highlighter palettes. 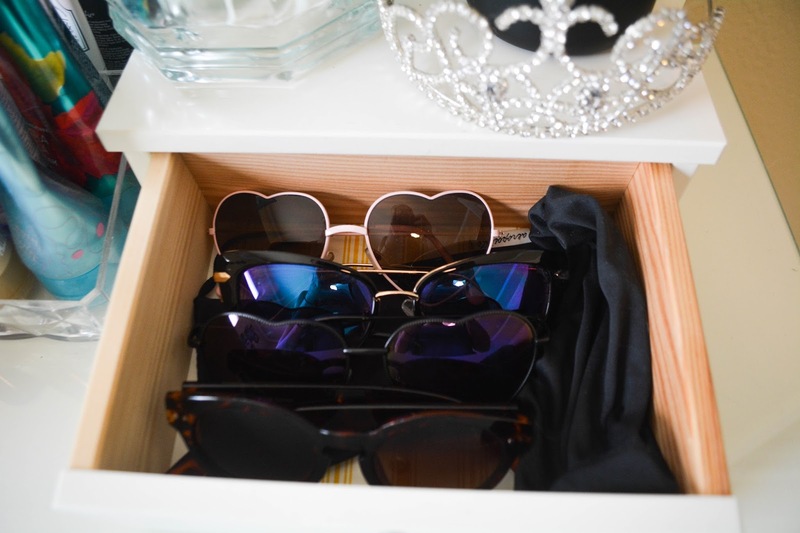 To the right of the acrylic tray I have another drawer which holds all of my sunglasses. 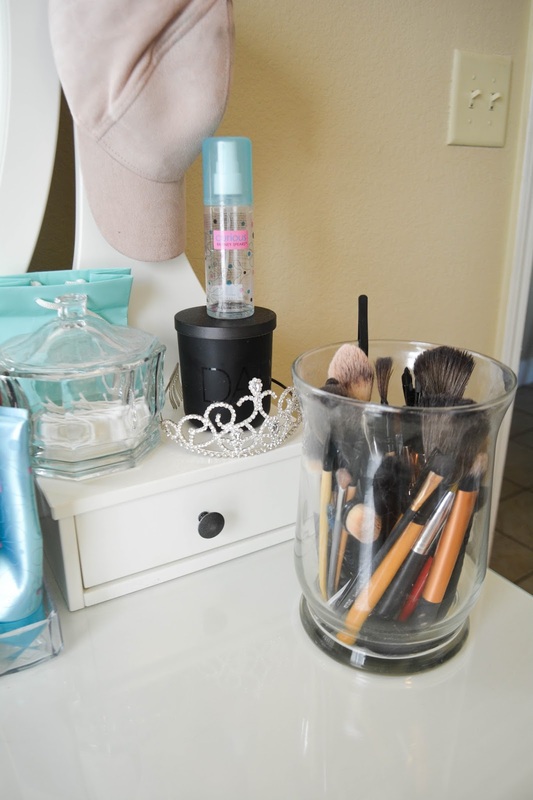 On top of the drawer I have a crystal bowl that I got from my grandma and I keep Qtips in there- very convenient for when I'm doing my makeup. 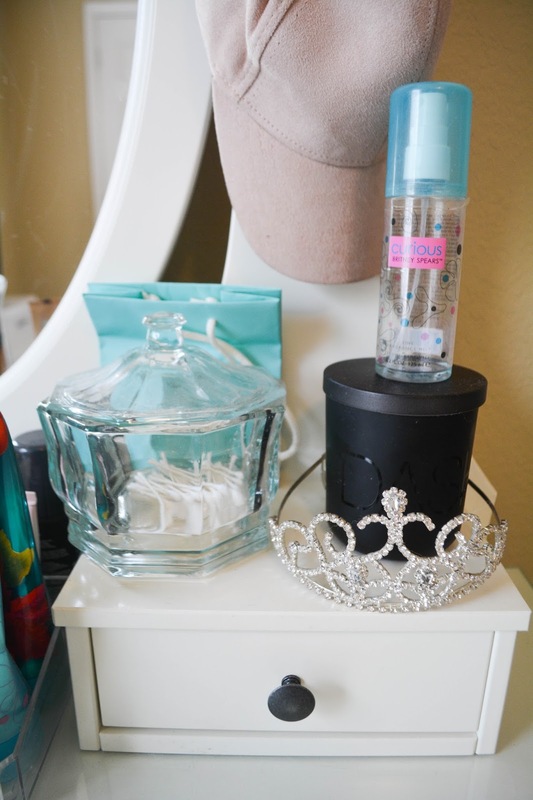 Next to that I have a DASH candle that I got at the DASH store in New York and sitting around it I have the tiara that Omar got me for my birthday a couple years ago. 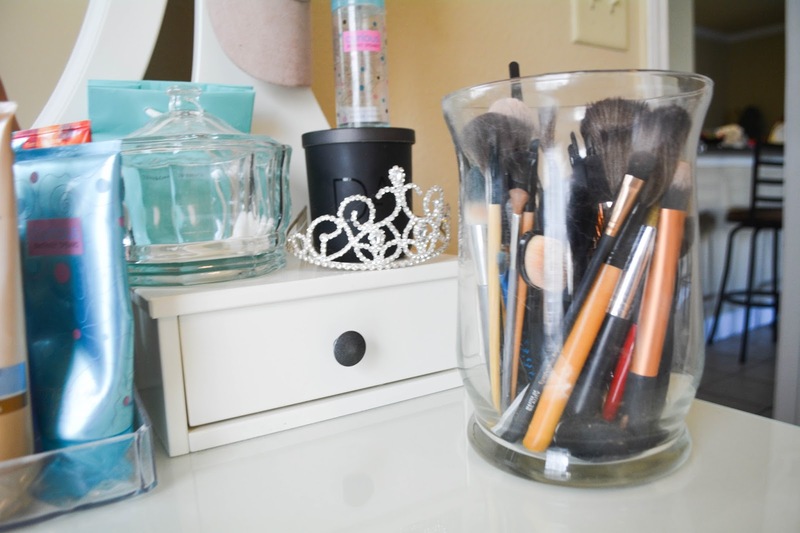 I keep all of my makeup brushes in this glass vase which I believe is from Target or Marshall's. 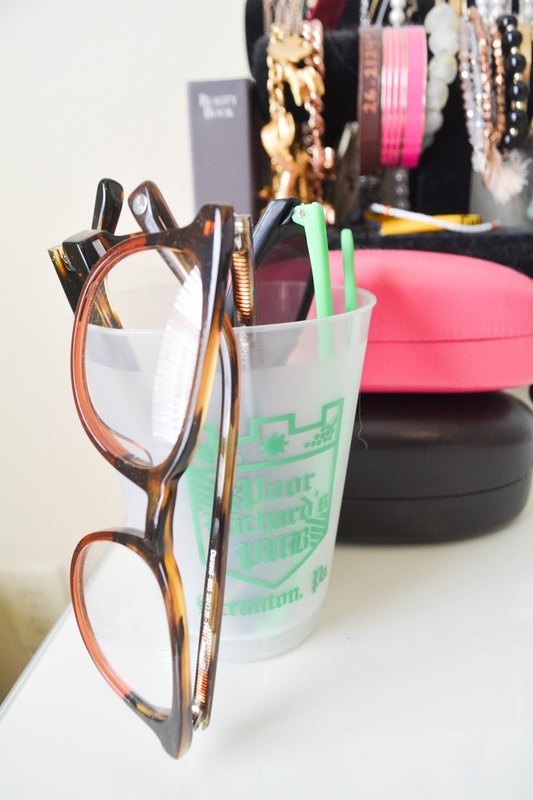 I also have a plastic cup that I got at Poor Richard's Pub in Scranton, PA. Inside of that I keep my spare glasses from Warby Parker and a pair of sunglasses I got at my friend Sam's wedding. 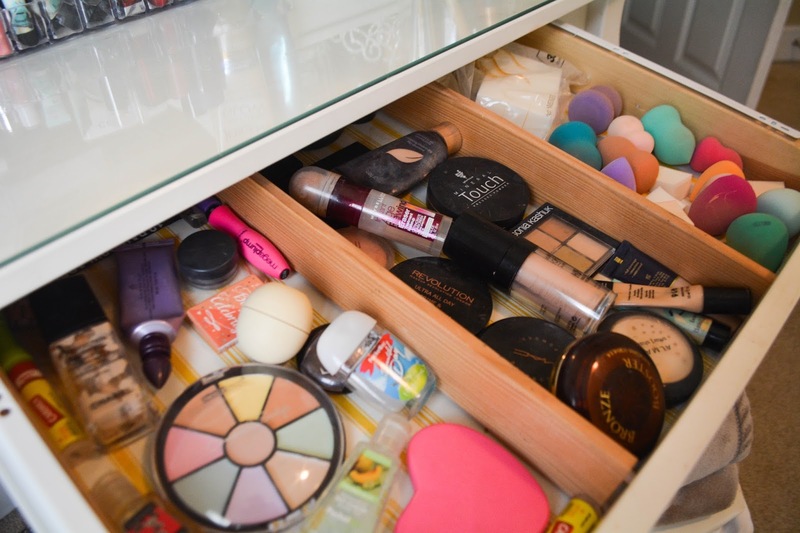 Inside of the longer drawer I have it (kind of) organized by catergory. 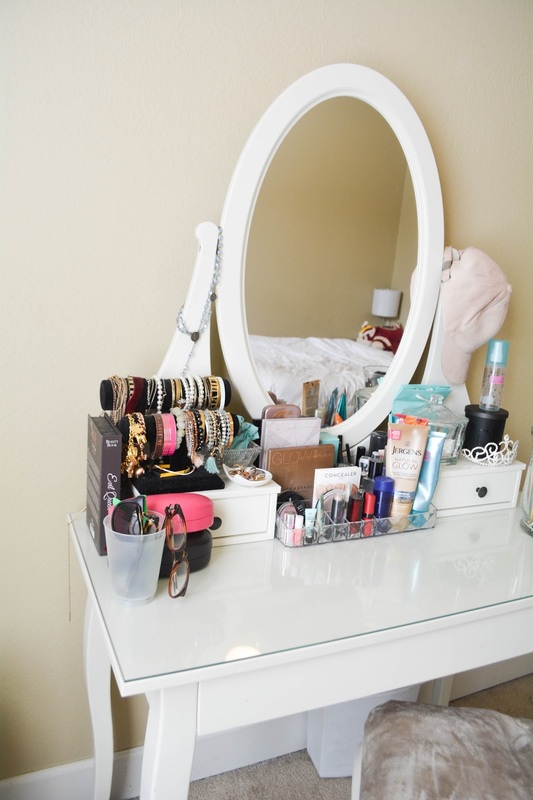 On the left I have extra eyeshadows, brushes, hand sanitizer and a pocket mirror. 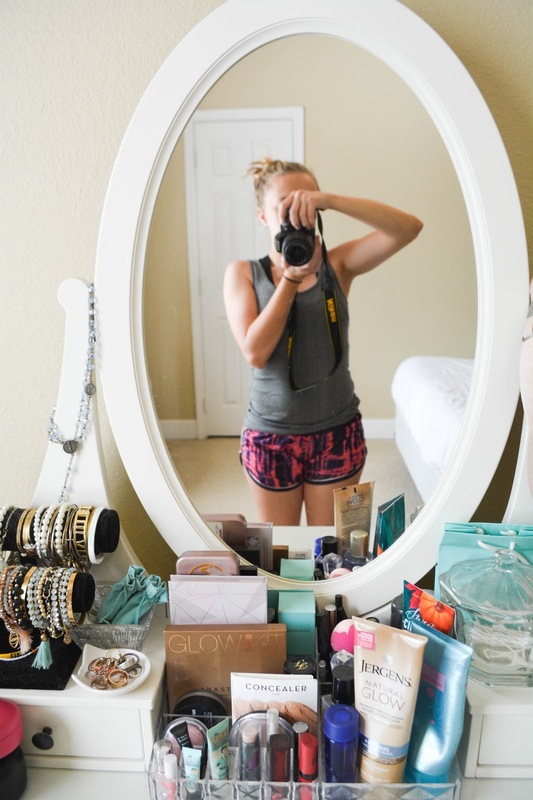 Fun fact, I got that heart shaped mirror from the Teen Vogue store in New Jersey almost ten years ago. 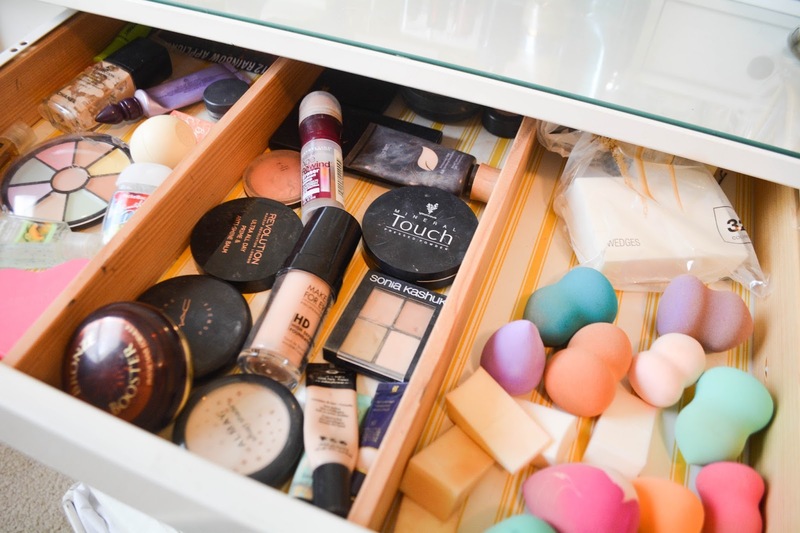 In the middle section I have extra face products such as foundations, concealers, blushes and bronzers. 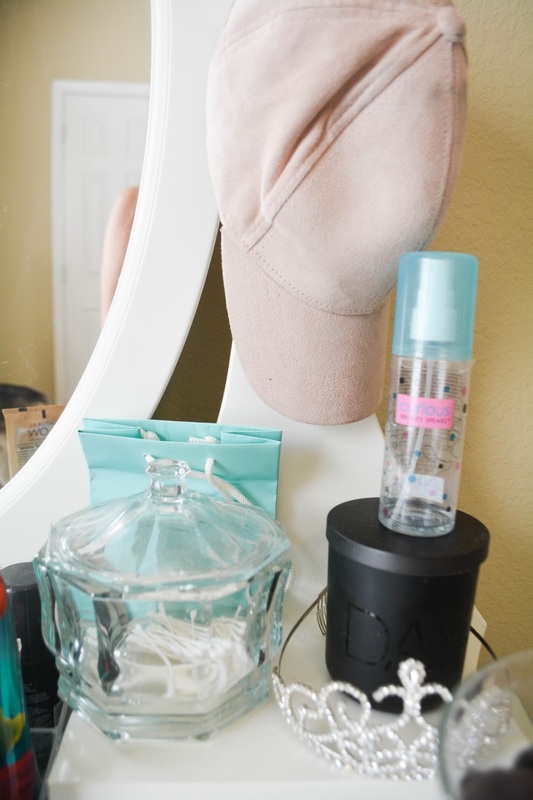 Lastly, in the right side is where I keep extra sponges and beauty blenders. Underneath of the vanity I just keep a small white trash can and I use this white storage cube as a seat. 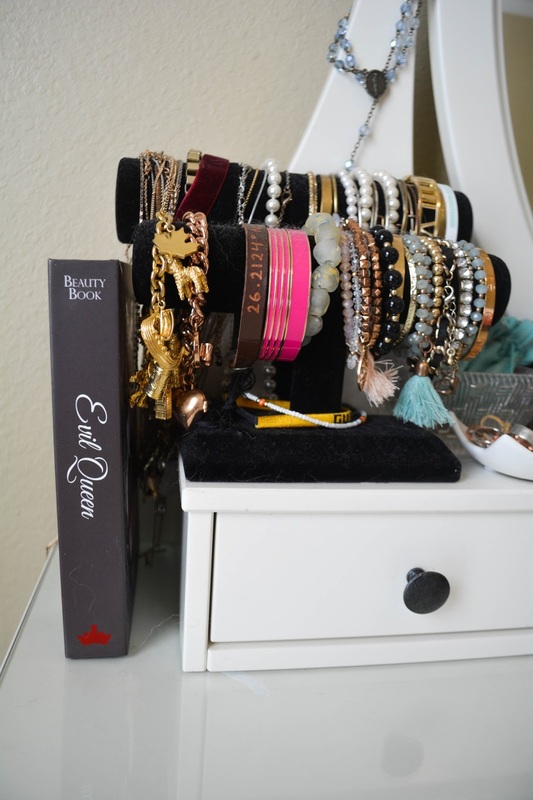 Even though my vanity has a very simple design I love it and I'm glad I'm able to add little details to it that make it more personalized. It's one of my favorite furniture pieces! 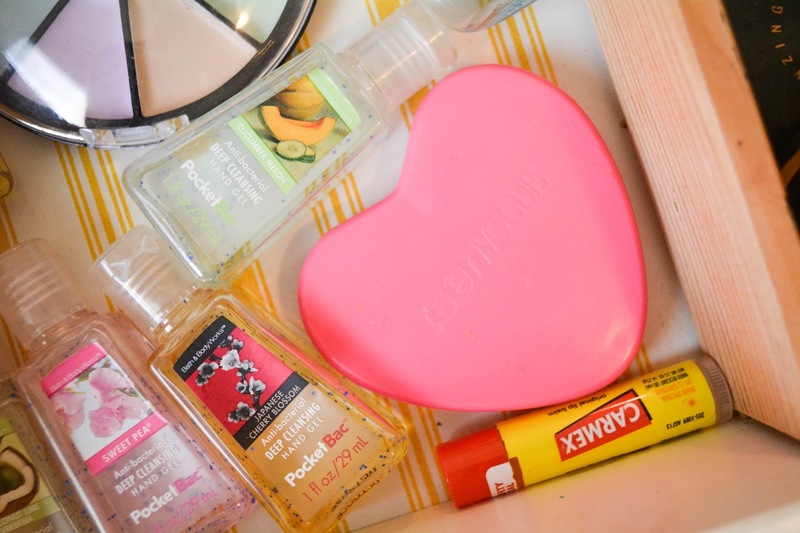 I linked as many things (including makeup) down below!